Don't blink, because Near Field Communications (NFC) might soon become a household term before you know it. Don't blink, because Near Field Communications (NFC) might soon become a household term before you know it. NFC is a wireless communication technology that when integrated with a smartphone enables users to pay for goods simply by waving their device over a payment pad. Over the past few months, there have been a number of rumors, along with some tangible albeit circumstantial evidence, that Apple is planning to include NFC technology in the iPhone 5. Indeed, there have been reports that Apple is already testing iPhone prototypes with built-in RFID readers in its labs - which, of course, isn't all that surprising given that Apple divulged that the iPhone 4 underwent rigorous testing in its labs for 2 years prior to its release. In any event, Google may very well beat Apple to the punch when it comes to using a smartphone as a wireless payment device. During Monday's Web 2.0 Summit, Google CEO Eric Schmidt demonstrated the upcoming version of the Android OS, codenamed Gingerbread, and showcased one of its new features - NFC technology. Schmidt explained that the next iteration of Android will enable users to hook up their credit cards to their Android phone and complete transactions simply by waving their device over a special sensor. And when can users expect to see Gingerbread on Android devices? "In the next few weeks", Schmidt noted. But even with the introduction of NFC capable smartphones, don't expect credit cards or cash to go anywhere anytime soon. There are still issues to be worked out with respect to security and having credit card companies fully commit to NFC initiatives. Also, it remains to be seen how receptive the general public will be to linking up their credit cards to their smartphones. So with Android 2.3, or Gingerbread, just a few weeks away, here's what we know so far about Apple's NFC related activities. Most recently Cult of Mac reported that the next iteration of the iPhone will let users carry their desktop data with them wherever they go via NFC technology. If users wave a NFC-equipped iPhone at a NFC Mac (they need to be in close proximity to interact), the Mac will load all their applications, settings and data. It will be as though they are sitting at their own machine at home or work. When the user leaves, and the NFC-equipped iPhone is out of range, the host machine returns to its previous state. Back in August, Apple hired Benjamin Viger, a near field communications expert to head up its mobile commerce division. Viger had previously been the man responsible for NFC initiatives at Sandisk and the French mobile operator Bouygues Telecom. More recently, Viger put his NFC skills to use at mFoundry where he helped oversee the PayPal Mobile service and the Starbucks barcode mobile payments service. 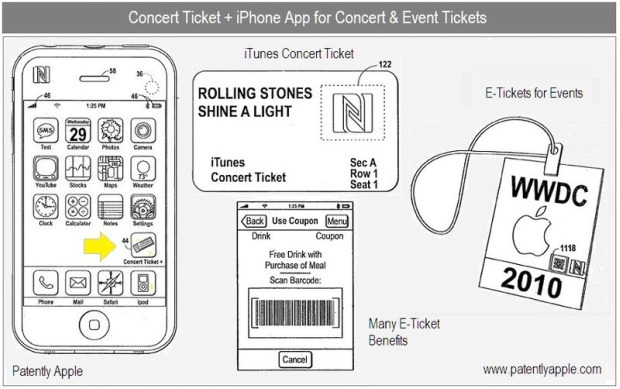 Jumping back a few months earlier, a patent application from Apple surfaced back in April describing a "Concert ticket +" feature that would enable iPhones with NFC functionality to be used as an e-ticket to enter concert venues as well as payment devices for the purchase of food, merchandise, and even exclusive concert footage. Clearly, NFC is a technology Apple is exploring, and with Google publicly showing off an NFC capable Android device, I wonder how long it'll be before people start saying, "Hey, remember way back when people used to carry around credit cards?" And below is video of Eric Schmidt at the Web 2.0 Summit talking about NFC and Android.